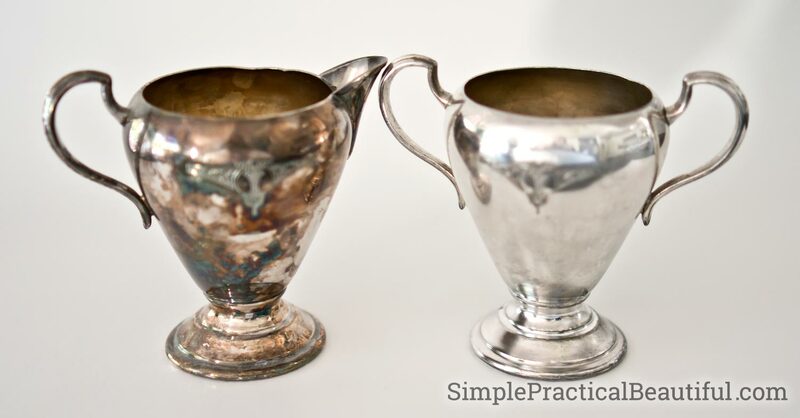 An easier way to clean silver without all the hassle of polishing. 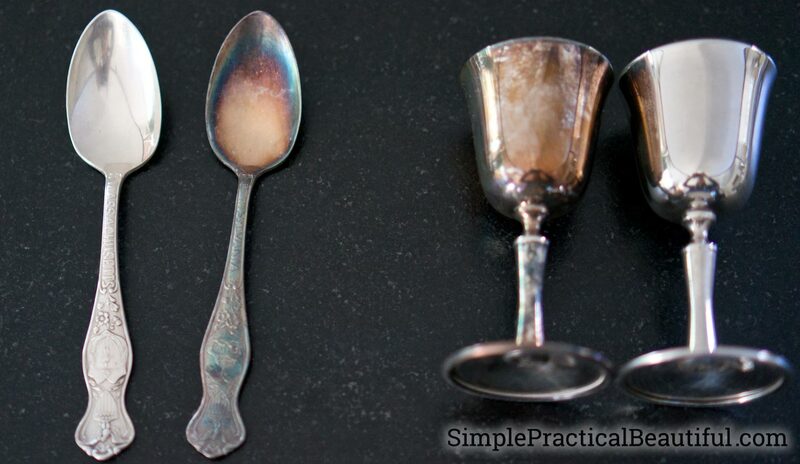 Remove tarnish and make your silver shiny with this easy DIY alternative to chemical polish. Welcome to the April Pinterest Challenge Blog Hop! The purpose of this Pinterest Challenge is to motivate all the participants of this hop (and you too) to not just pin, but to make it happen! So this month, I chose to try an easier way to clean silver. 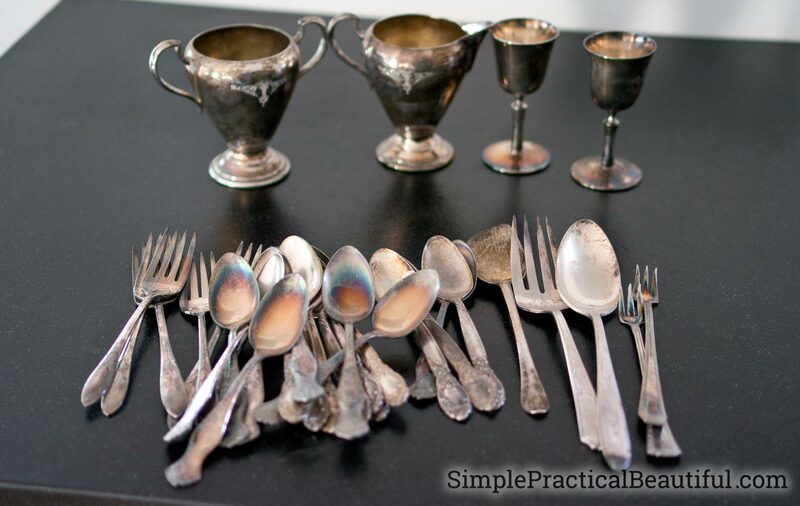 I pinned this Easily Clean Silver idea from H2OBungalow.com a while ago because I loved the idea of being able to clean silver without all the work of polishing. I wondered how well it would actually work, but I never got around to trying it until this month when my daughter had a Mad Hatter Tea Party for her birthday and we needed to use my silver. So, I got out all of our silver for the tea party—my silver spoons and forks, a couple of silver candle sticks, and a cute but tarnished cream and sugar set—and got ready to soak them. 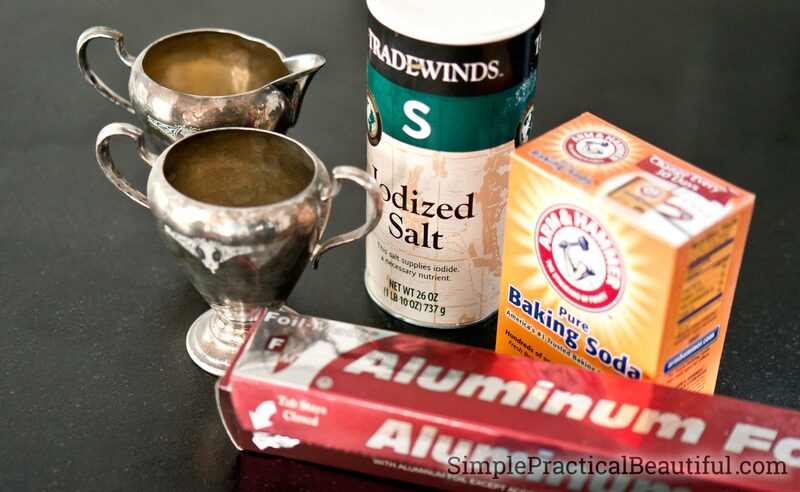 The silver polishing “recipe” calls for baking soda, salt, aluminum foil, and hot water. In the post on H2OBungalow.com, Wendy places two sheets of aluminum foil at the bottom of her sink and fills the bowl of the sink one-fourth with hot tap water, then adds a half cup of baking soda and a half cup of salt to the water. She soaked her tarnished silver for about 10 minutes then buffed it with a soft cloth to removed the tarnish. I have a brand new farmhouse-style sink, so I didn’t want to soak the silver in my sink bowl. Partly because that would have taken a lot of water and party because I’m not sure if the process would affect my sink’s finish. So I used a plastic bucket inside the sink instead. Otherwise, I followed her process exactly. I hate polishing silver, so I was really hoping I could totally avoid rubbing down the silver. However, buffing the silver after it soak took a little work. It was not nearly as much work as using silver polish, but more work than I expected. I did find that the hotter the water was, the less buffing it took to remove the tarnish and the better it worked (I had to do a few batches to get all my silver cleaned—you can see the difference in the photo below). I’ve seen other blogs that did this same process but used boiling water. I think I would try that next time. The process did remove tarnish, but not quite as well as silver polish. My grandmother would not have been happy with the results, but the silver was definitely shiny enough for a Wonderland Tea Party. So my verdict is that it worked pretty well. 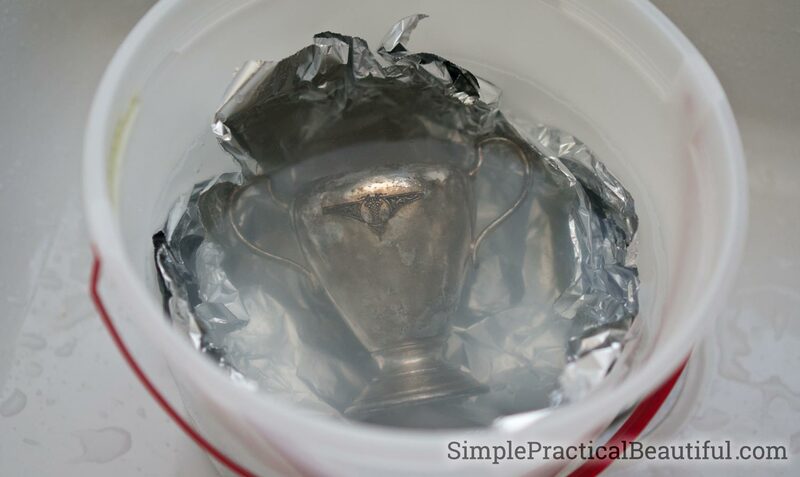 This is a much easier method to get your silver shiny and looking beautiful. However, if you’re hosting royalty, or my grandmother, you probably want to pull out the silver polish and do it the old-fashioned way. 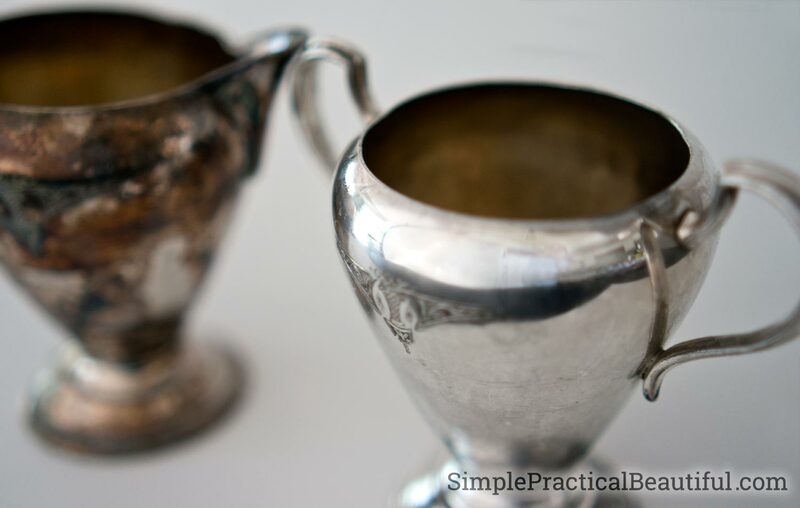 One final note: Once you’ve removed all the tarnish from your silver, there’s an easy way to keep it shiny forever without every polishing, or buffing, it again. 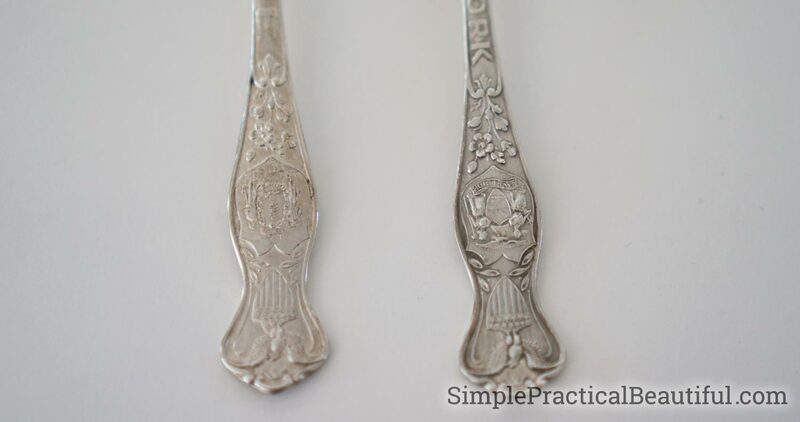 Check out how my post on how to keep metal shiny. It works on brass, copper, and other metals too. I’m not sure if it’s food-safe, so it’s probably best to used it on display-only metals. Check out all the fun great ideas below from other bloggers in this Pinterest Challenge and take a look at the February Pinterest Challenge here for more Pin-tested ideas. This is so good to know, we have a couple of silver things (that we never use, just look at!) and I rarely get round to polishing them. To know this actually works is really helpful. thanks. My daughter has a silver cup from her baptism & it’s our only piece of silver. I noticed how tarnished it was the other day & had no idea how to clean it. Pinning & going to try this. I’ve always wanted to try this! I’m so glad that you did and that your pieces turned out so beautifully! I’m going to give this a try. Pinning to share! Great tip. I think your pieces look markedly better. And I love that you had a tea party with them! What great fun. I appreciate your frank review of how the process worked. I have my husbands’s great grandmothers sterling so probably not with that. I wonder if sterling vs silver plate makes a difference? 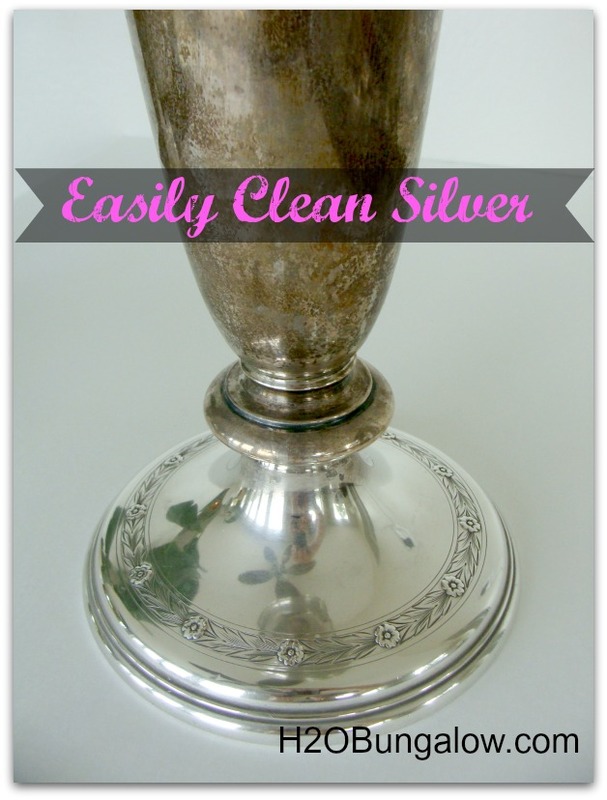 Thank you for sharing my tips for cleaning silver. Glad it worked for you (for the most part..lol). I’m so glad you shared this tip on your blog because it saved me so much time getting ready for my daughter’s party!! I love reading your blog. You have so many great ideas and I love your beachy style. I’ve gotten lots of inspiration from you for my California home. 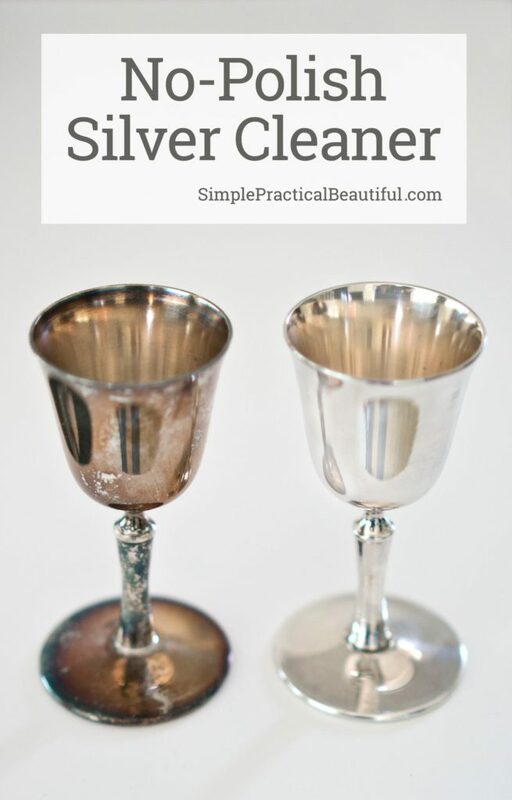 Thanks for sharing this, I too love the idea of an easier way to clean silver. I appreciate your thoughts on how well it actually worked! I’ve tried this method and had mixed results. I have not tried using boiling water. That’s a great tip. 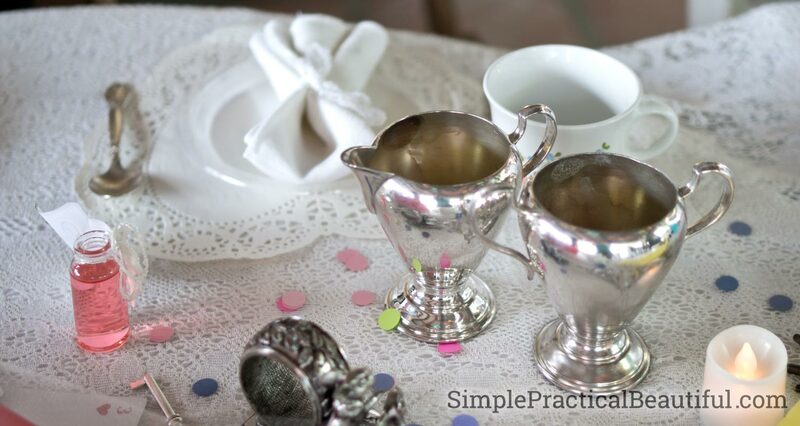 Your silver might not be shiny enough for your grandmother, but it looks great for your daughter’s tea party. Thanks for sharing your results. I have some silverware I need to polish because I always forget to put it away in the case that protects it! I will definitely be trying this. Along with your tip about the boiling water. I have seen this pin and always wondered how it worked. Thanks for sharing. I wonder if this would work on jewelry? I don’t have any silverware to polish, but I do have silver jewelry. Will give this a try with boiling water and see if it works. Yes, it would definitely work on silver jewelry. It might be a little hard to get any tiny details perfectly shiny, but I’ve read that this method is less harsh on jewelry than traditional silver polish. Thanks for the great tips, I will definitely try them the next time I clean my silver. I usually just use toothpaste and a soft cloth, but I have to admit that it’s not the best possible method, mostly because I want to rinse the silver after the toothpaste, which makes it lose its shine and blackens faster this way. I actually never considered using foil before, which is a big loss.